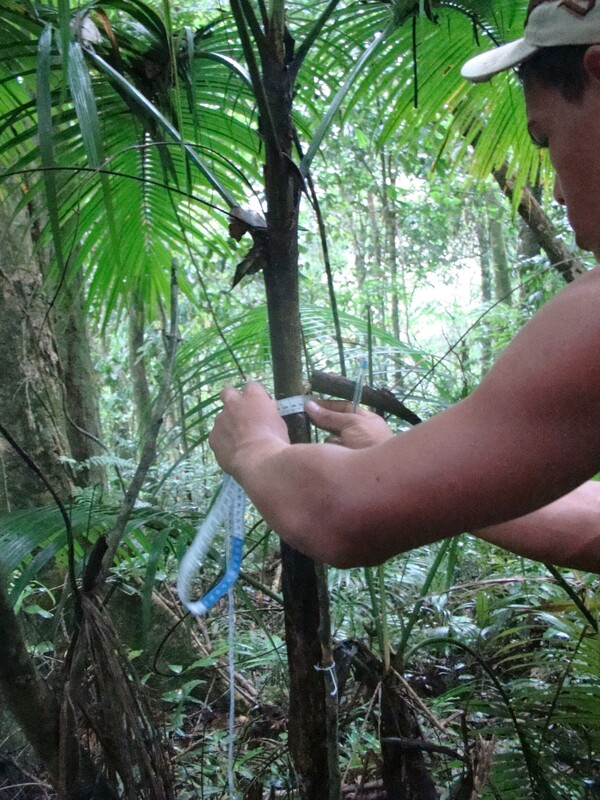 This paper analyzes the results of an Atlantic Forest enriched with seeds from palm juçara in Quilombo Communities in the Ribeira Valley – SP, as well as the difficulties and bottlenecks involved in implementation of sustainable management of this species. The work was constructed from field survey of populations of the palm and also in workshops and participant observation. The results indicate the need for improving incentives in public policy and in collective management of natural resource. The Instituto Socioambiental is right now implementing a project, called “Plano diretor para recomposição florestal visando à conservação de recursos hídricos da bacia hidrográfica do rio Ribeira de Iguape e Litoral sul” [Planning scheme for the forest reconstruction, aiming at the conservation of the water resources of the basin of the Ribeira river and the southern coast]. The project will define priority riverbank areas, to be reconstructed as riparian forest. The project involves representative of public bodies, farmers, trade unions, associations, among others, from about 20 municipalities of the Ribeira valley region, in the S. Paulo state. The project uses sound mapping tools, combined with participatory methodologies. I’ve contributed as animator in two regional workshop, in Registro and Juquiá. Translated from the news appeared on the Instituto Socioambiental website. A woman from Ivaporunduva showing her landraces and seedlings. Eldorado, October the 23, 2010. Photo by Glenn Makuta. The Feira de Troca de Sementes e Mudas Tradicionais [Fair of Landraces Exchange] presented this year more than 100 etnovarieties of landraces and traditional seedlings. A generous offer of rice, beans, cassava, farmyard chicken – all natural inputs – allowed six cooks, also from the villages, to prepare a delicious collective lunch. The Fair, at it 3rd edition, counted with new supporters, as of the Núcleo Oikos, as well as with long-standing ones, as the Norwegian Church Aid, while grew the engagement of the Instituto de Terras do Estado de São Paulo [Land Institute of S. Paulo State] and of the municipality of Eldorado and Itaóca. Local business supported with little sums the event too, and that it is very important, showing the involvement of the local society. The renown the Fair is obtaining in wider circles was proved by the participation of other quilombola (afro-descendant) of the region (Peropava village, in Registro), craftswomens’ groups (Feito a Mão, from Apiaí), urban farmer (Ana do Mel and her family, from Embu-Guaçu), rural trade unions (of Cajatí), governmental bodies, as Ministério da Agricultura [Agriculture Ministry], Sabesp (in charge of the water), Cetesb (environment licensing) and Incra (land policy), among others. A group from S. Paulo, interested in knowing more about quilombola villages participated too, and after the Fair they followed, going to the Ivaporunduva e São Pedro villages, and spending there their week-end. New challenges follow the work of those who are involved with roça (cropping), preparing a new fair. The fair, in the words of Ms. Zulmira, from Porto Velho, more than bringing food, brings much union: “For each fair, the sales grow and the relationship strengthen”, she said. The fair was covered by the Globo Rural. Watch the video here (in Portuguese). Fanelli, Luca; Pasinato, Raquel. Sementes tradicionais em comunidades quilombolas do Vale do Ribeira (SP) [Landraces in quilombola villages of the Ribeira Valley]. Oliveira Junior, Clovis José Fernandes; Fanelli, Luca. Populações de palmeira juçara em comunidades quilombolas no Vale do Ribeira [Juçara palm population in quilombola villages of the Ribeira Valley]. Coming from Piemonte (Italy), the students of the University of Gastronomic Sciences (UniSG) created, together with local cooks, two workshops in the Ribeira Valley quilombos of Ivaporunduva (Eldorado, SP, Brazil) and Mandira (Cananéia, SP, Brazil). Read more on the Instituto Socioambiental web site (in Portuguese). Late in October the Brazilian journal O Estado de São Paulo published an article about the trip. See it (in Portuguese). Semeando sustentabilidade . A juçara e as comunidades quilombolas no Vale do Ribeira [Sowing sustentability. The juçara and the quilombola villages in the Ribeira Valley] presents, in a simple and pleasant way, some issue related to the conservation, the management and the use of the juçara palm (Euterpe edulis) and, more specifically the results of a project, supported by the Ministry of the Environment PDA programme. Contents: Map to a scale of 1:160.000 of the project implementation region, pointing out the quilombola villages, the protected areas and the main activities executed – Pictures with explanation – The juçara, the Ribeira Valley and the project: a chronology – The ecological knowledge of the quilombola people about the juçara palm – A participatory tool used to debate within the communities the problems related to the juçara management – Project results – Next challenges – Another experience with juçara palm management in the Atlantic Forest – Elucidation about set of rules about juçara palm. Sowing sustentability was published by the Instituto Socioambiental (ISA), with the support of the PDA Programme of the Ministry of the Environment. I edited this publication, together with Nilto Tatto. Sowing sustentability is in Portuguese, and an on-line version could be downloaded here.